Oh, how amazing it is to have a job that can pay the bills and let you do whatever you want! Right? But before you can actually get paid for your job, most employers would require you to sign multiple forms and any one of these forms can be an employee payroll form. As its name implies, employee payroll forms need to be filled out to ensure that you get paid for the services you have rendered for your company and that you give the government what is due to them for the specific privilege of getting a job. This article focuses on providing new employees with basic information on how to fill out employee payroll forms. Also, this article is filled with different examples of payroll form templates that any employer can use for their own company or business. 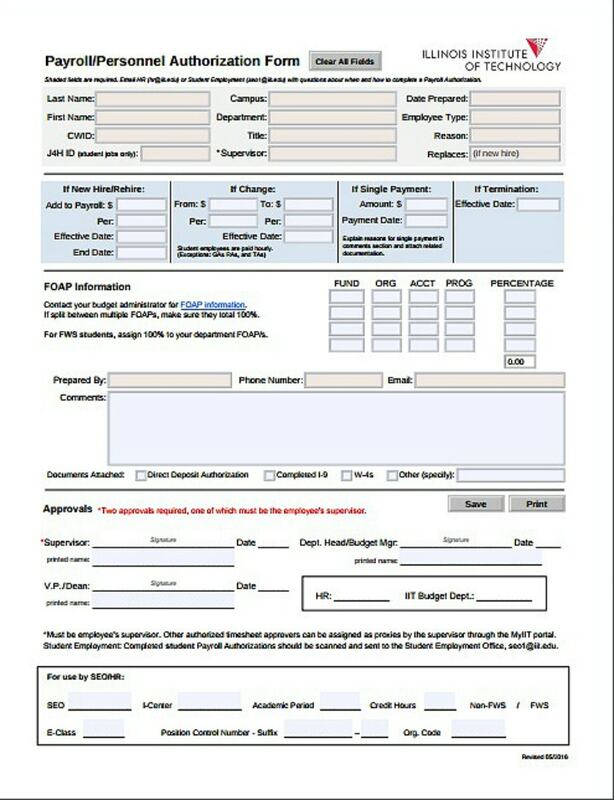 New employees may also download and use these sample form templates if they want to practice how to fill out these forms before they actually submit the required payroll forms to their employers. 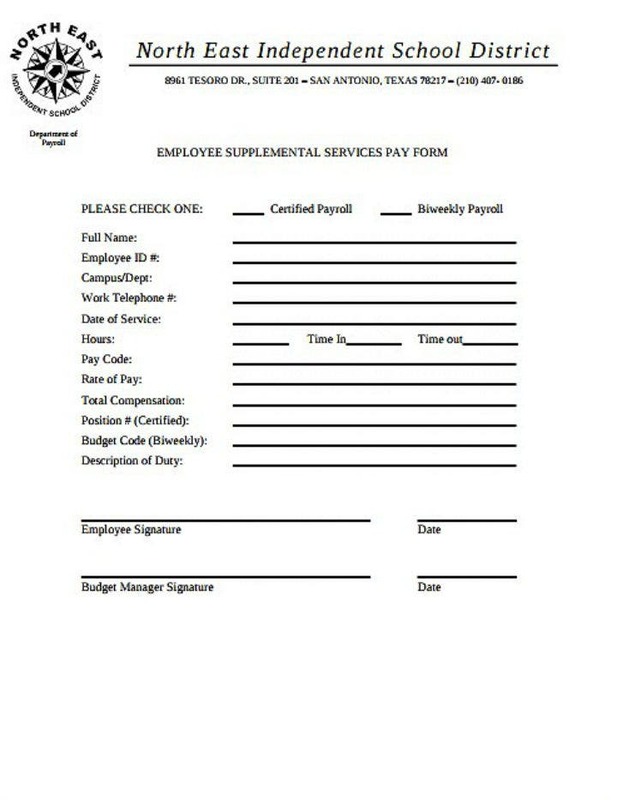 Embedded below are multiple examples of employee payroll form templates. All these templates are available in PDF template format. This means that you may download, view, and edit these template files as long as you have Adobe Acrobat Reader or other compatible software tool installed on your computer. What are Employee Payroll Forms? 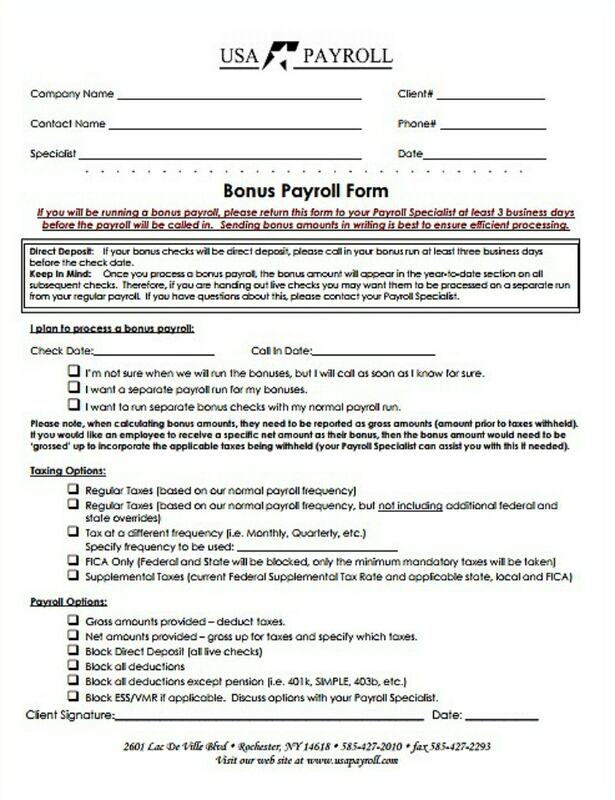 There are different kinds of employee payroll forms. Some employee payroll forms are documents detailing the employment terms that a person and his or her employer agree upon. While other payroll forms are questionnaires regarding the employee’s tax status, income sources, and other personal information that will be used in calculating his or her salary and the amount of money that will go towards his tax and retirement contributions. To simplify things, it is best to think of employee payroll forms as a way to ensure that an employee gets paid for the services he or she has rendered. Also, most companies will have their own formats for their respective employee payroll forms. Examples of which are shown in this article. 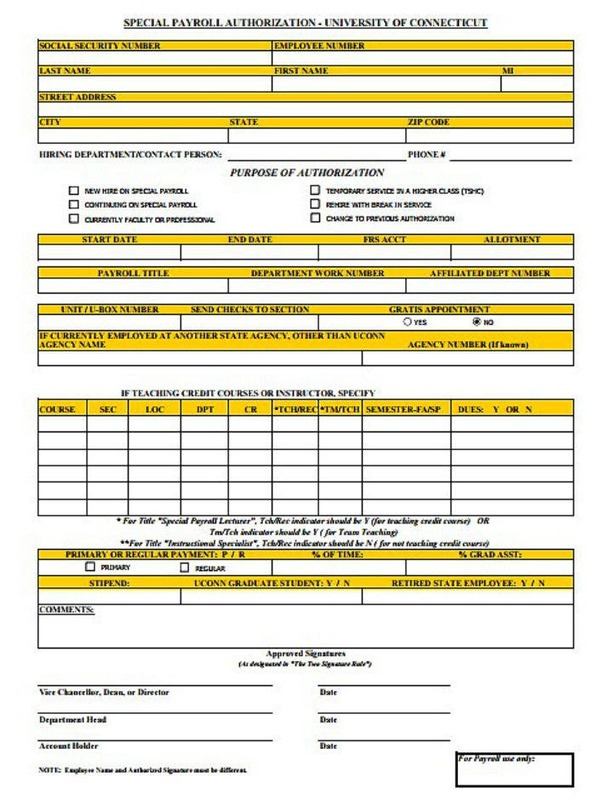 Just remember that when your employer asks you to fill out an employee payroll form, you would most likely need to fill out a number of forms and questionnaires. For example, you may have to fill out and submit an employment tax form, a bank account payroll authorization form, paycheck stubs, and other employee contribution forms. Be sure to read the rest of this article so that you will become more acquainted with the different forms needed before you can start your new job. On the other hand, if you are a human resource personnel, you may check out this article on strategic payroll preparation tips. 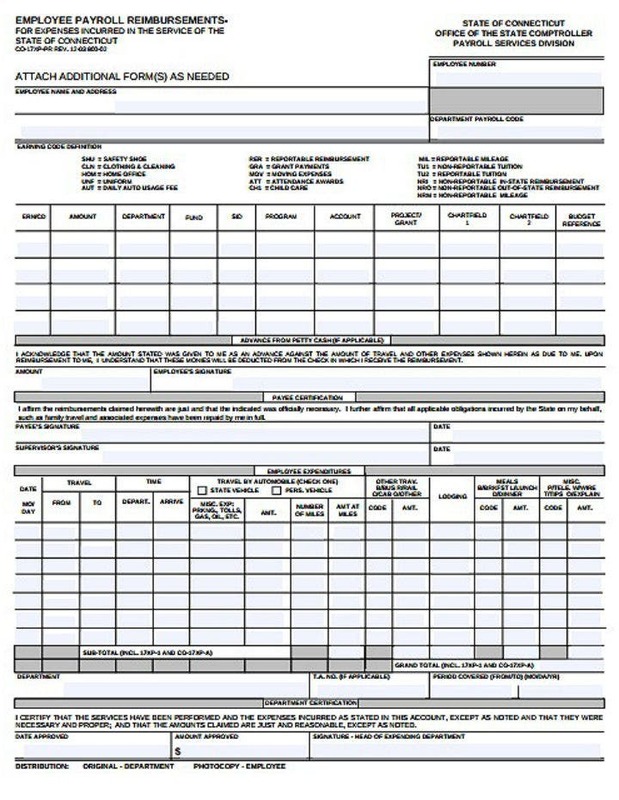 As we have mentioned earlier, employee payroll forms should ideally be filled out or completed by a new employee before he or she starts his or her new job. Doing this ensures that all the services that the new employee provides are automatically covered by his or her employment contract and he or she will get paid for it. However, this may not always be the case since most company HR offices can get swamped with other work and remind new employees to fill out these forms may be overlooked. To avoid this, new employees should be proactive enough in mentioning the need to sign and submit your employee payroll forms right after you sign your new job contract. This way, everything will go on smoothly in your new job. And to help you better prepare for your new job, we have compiled the top guidelines that anyone should follow when filling out employee payroll forms. When filling out any kind of employment form (or any official forms for that matter), you should make sure to read the form closely beforehand. This allows you to have an idea of what the form is all about and lets you better prepare on what to answer on each question on the form. For example, if you see that your employment payroll form asks for your social security numbers and you have not memorized it, you will still have time to to get your social security card and note down the correct security number on the form. Doing this will help you minimize getting errors when filling out the form. 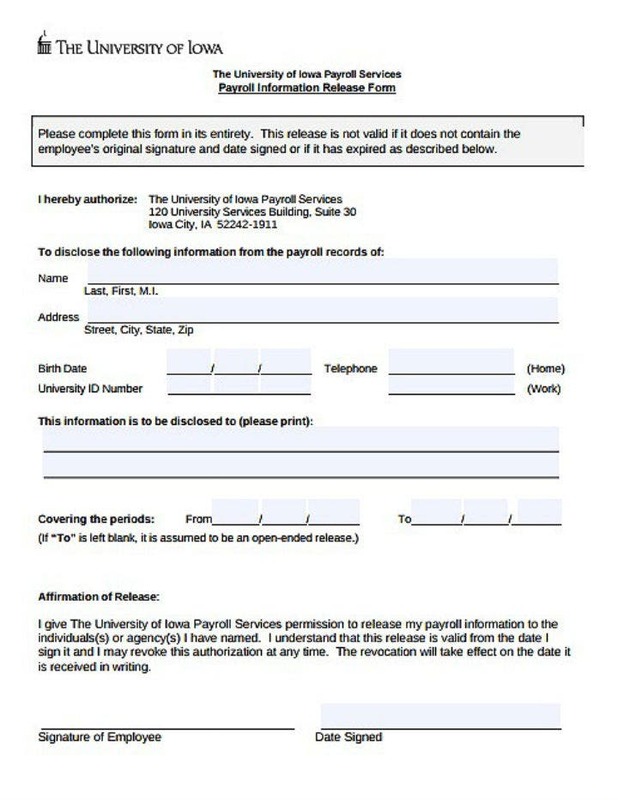 In connection with the previous tip, anyone who is filling out an employee payroll form should always remember to read the instructions on how to fill out the form. 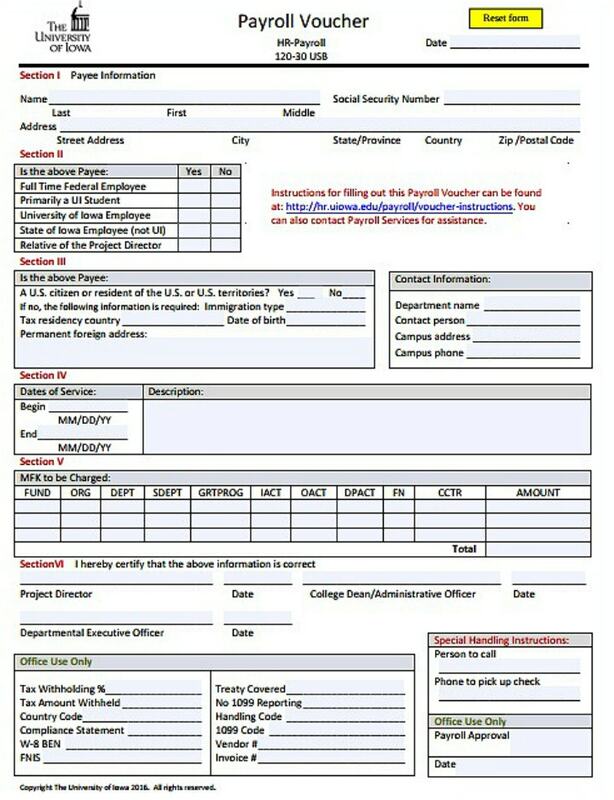 Some government forms, for example, are very particular in the way you write or print the answers to the questions on the form as this will affect how your personal information will be inputted into the company or government database. So if you are filling out a payroll form, always err on the side of caution and read the instructions template first. Some employers will require new employees to agree for an employment history verification to be done as part of the employee onboarding process. 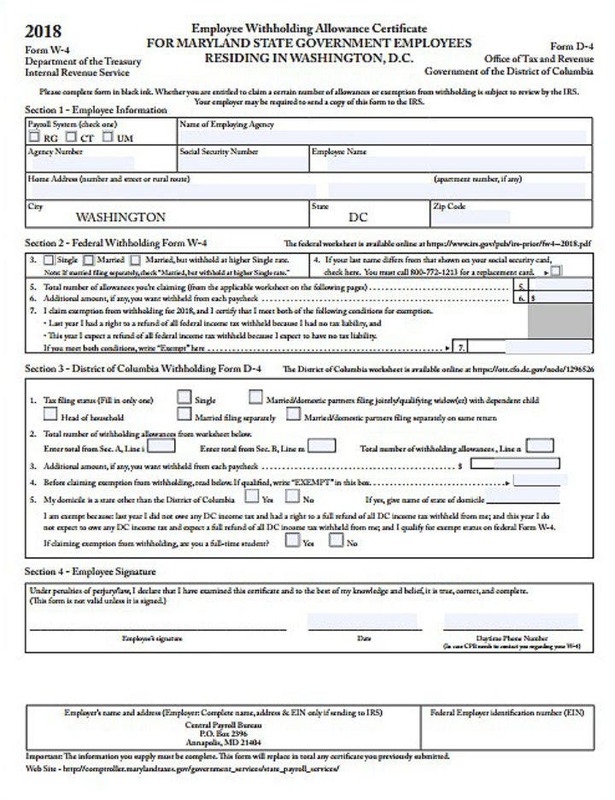 And, most often, this agreement form will be included on the loads of employee payroll form that you will have to sign. Employment verifications are done to ensure that a new employee is a trustworthy person and have the necessary skills to do his or her new job. Aside from employment history verification, companies may also require a background security check for all new employees. This often happens if you directly applied to an employer without following an agency application process. Nevertheless, just make sure that you agree to the terms of the background security check included in any of the employee payroll forms that you may have to sign. Another helpful tip when filling out employee payroll forms is to ensure that you only write accurate and up-to-date information on the payroll forms. Remember that most employers can and will do background checks on any new employee. And if they find irregularities or discrepancies on the information that you have stated on your payroll forms, this may be grounds for unemployment. If you are curious, check out this article to find out the different steps to conduct a background check. Another tip that every new employee should be reminded of is to make sure that they write the correct bank account information on their payroll forms. Some employers will allow their employees to designate a bank account where they can direct deposit their monthly earnings. 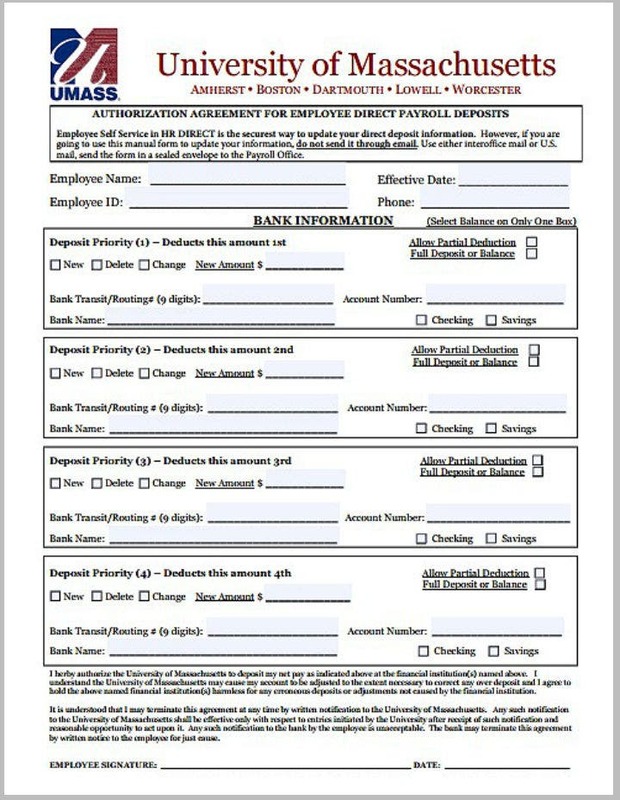 Problems may arise if you incorrectly type or write down your bank information on the payroll form. Protection of ones personally identifiable information is something that you should be concerned about when filling out employee payroll forms. Most companies will have their own privacy policies in place so you should make sure that you read and understand them before agreeing to sign your payroll forms or other employment forms. And if you have questions or complaints about the employee payroll forms that you have to fill out, it is best to tell the company’s human resource officer about this. 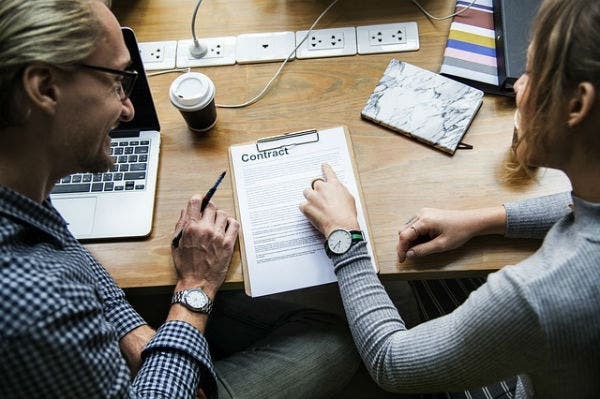 You may also consult a labor law attorney if you wish to have a better understanding of the different terms and conditions of your employment contracts and payroll forms. It is better to delay the signing of your employee payroll forms than to sign it quickly without understanding what the forms really entail. This will save you more legal form and financial trouble in the future. 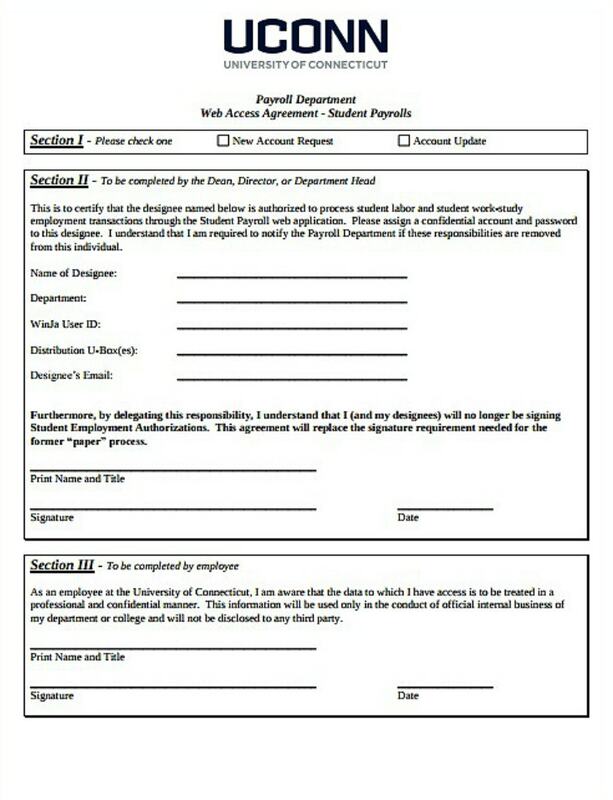 Lastly, most employee payroll forms will require the employee’s signature for it to be legal and binding. Make sure to affix your signature on the printed forms before you submit them back to the company HR office form. So those are the top tips that any new employee should follow when filling out their employee HR payroll forms. Most of the tips mentioned above can also be applied when filling out other forms of official forms, contract template, and agreements. 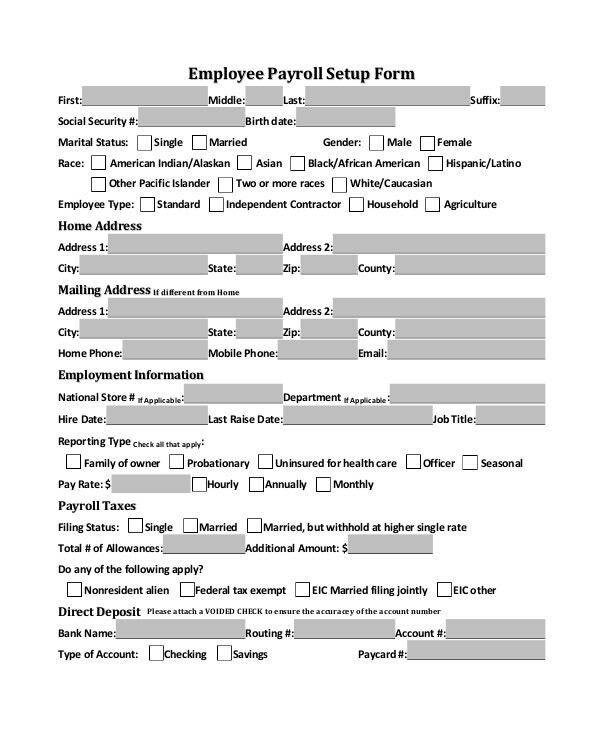 Are You Ready to Fill Out an Employee Payroll Form? This article is filled to the brim with helpful tips on how to best fill out employee payroll forms and other official business forms that anyone may be required to submit for their new jobs. Study and apply the different tips you have learned here today so that you will have an easy time adjusting to your new job. If you found this article list useful, do not hesitate to share it with your social media friends and followers.